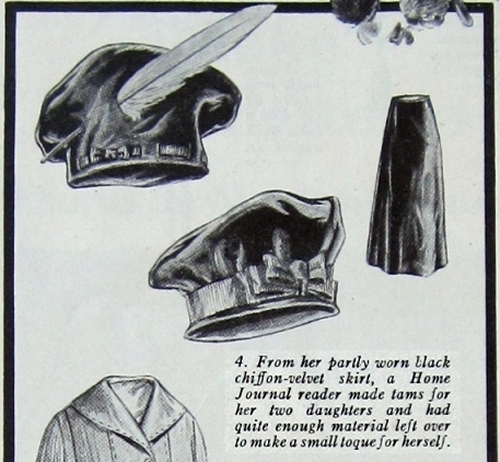 Some work clothes for women suggested by Ladies’ Home Journal, Sept. 1917. Illus. signed Sheldon. 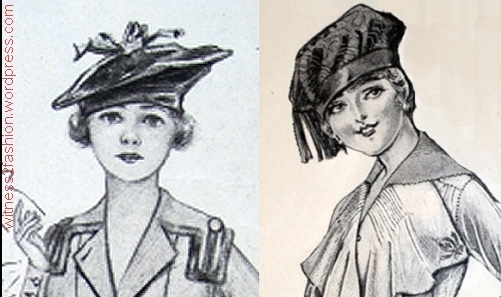 This article suggests seven different work outfits suitable for American women in wartime. 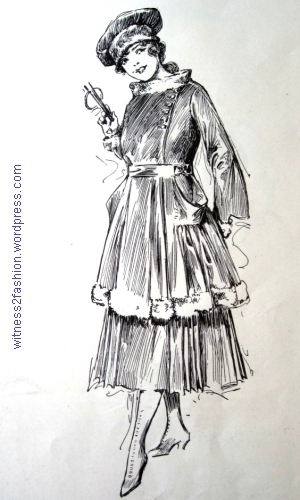 One of them, surprisingly, is a dress with a divided skirt — what would later be called a culotte skirt. 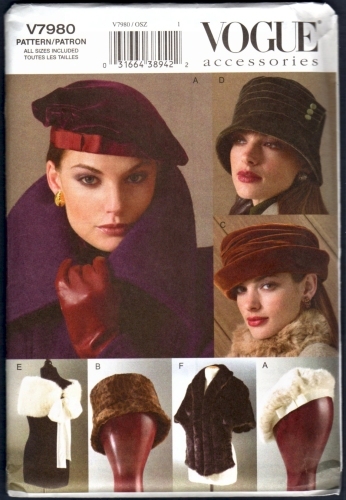 Sadly, although the Ladies’ Home Journal sold its own mail order patterns, none of these outfits has a pattern number. 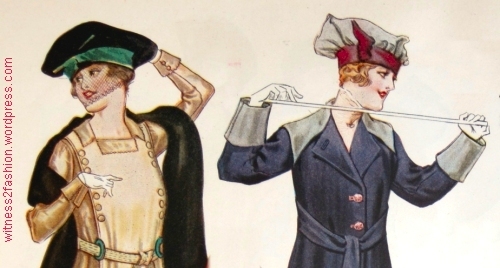 The article is “editorial,” suggesting that outfits which would have been rather shocking a few months earlier may now be “safely” worn on the streets and in the stores of an America at war. 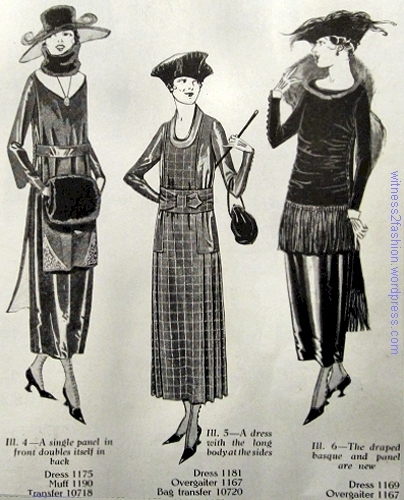 I’ll show an overview first, and then describe each outfit with its accompanying text. 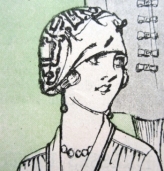 Except where noted, all illustrations are from the same Ladies’ Home Journal article, dated September 1917. 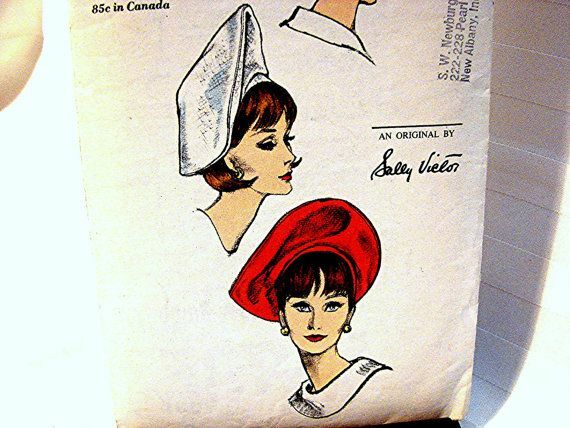 Butterick pattern No. 9294 for a smock dress over bloomers. House-dress No. 9288 is on the right. 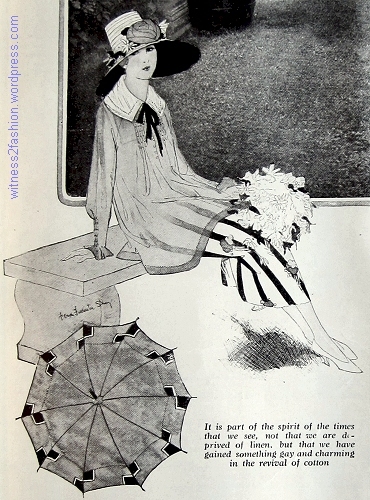 Delineator, July 1917. 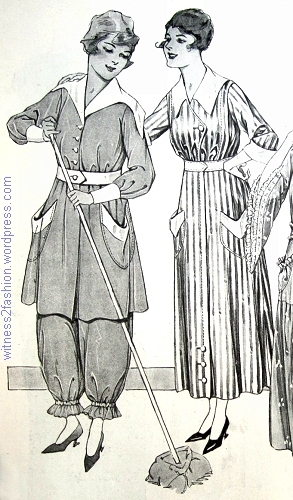 “For the home-reserve corps comes this new costume (design 9294) suited to the woman who wants to go on active service — either at home, out camping, or for gardening.” The house-dress next to it shows a typical hem length for women. 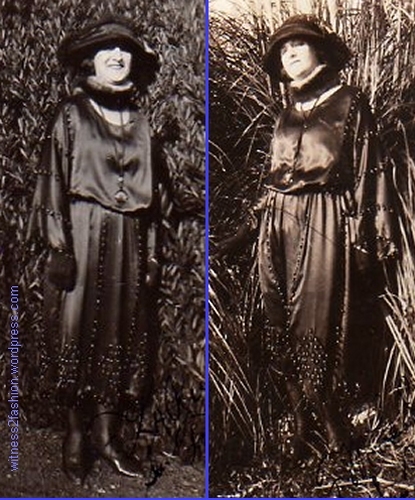 As skirts became shorter, they were usually worn with opaque stockings or boots. Butterick pajama pattern No. 9400, Sept 1917. Delineator magazine. 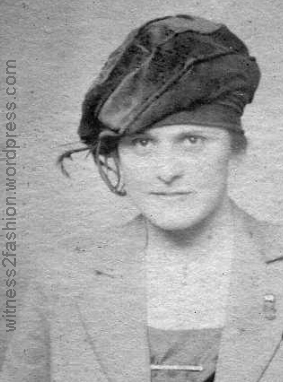 “[These] trig knee-buttoned trousers …, worn with a laced skirted blouse, tam and laced high boots, were designed for an ardent motorist. 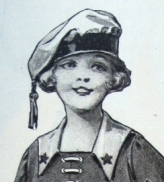 Surely even the most stubborn opposition could be overcome at sight of these!” For an official Red Cross Motor Corps Woman’s Uniform, click here. “It may be that the fair farm maid . . . has paused dissatisfied with her work, but surely no doubt could lurk in her mind as to the fitness of her well-made olive-drab khaki suit. 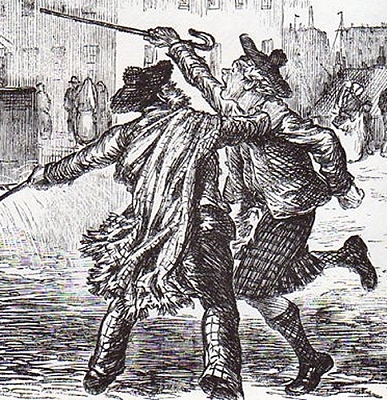 Side fullness given by plaits [pleats] begins at the underarm and ends at the hem.” “[Above] One may rake, pile, and burn autumn leaves in the serene consciousness that no flickering flame will catch on the strapped leggings worn with [this] pocketed bloomer suit. 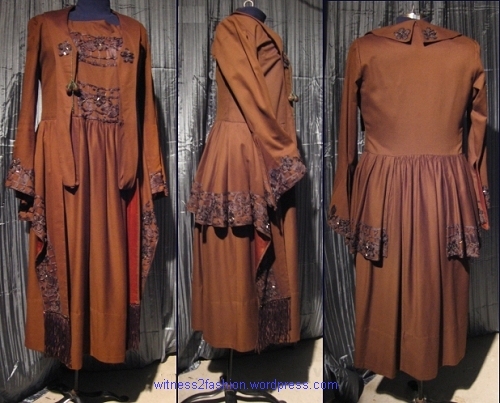 . . .” “Indoors expediency demands simplified dressing, and the adoption of such an attractive combination — apron, blouse, divided skirt — as shown above . 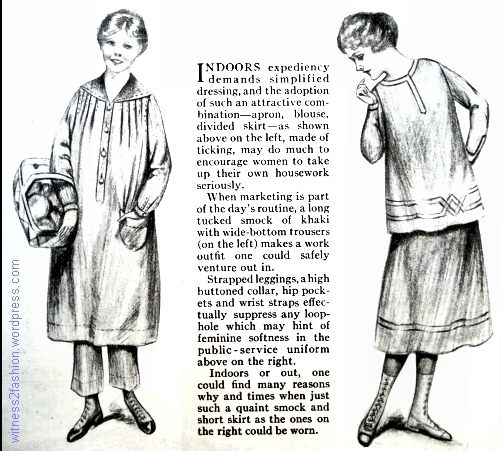 . . made of ticking, may do much to encourage women to take up their housework seriously.” [Note the unusual “divided skirt!” In 1917, the word apron could refer to a garment we would now call a dress.] 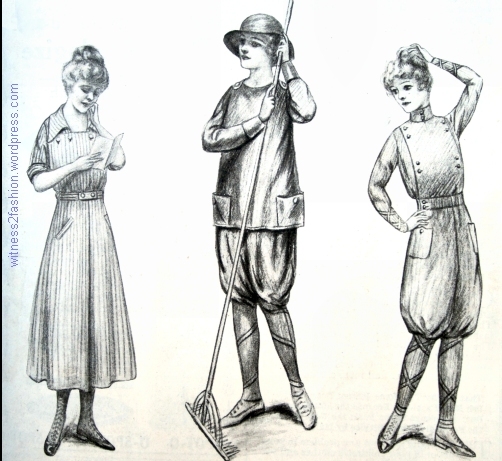 “When marketing is part of the day’s routine, a long tucked smock of khaki with wide-bottom trousers… makes a work outfit one could safely venture out in.” [Think about what is implied by “safely.” The government encouraged women to collect their own groceries rather than having them delivered, freeing the deliverymen for active service.] “Strapped leggings, a high buttoned collar, hip pockets and wrist straps effectively suppress any loophole which may hint of feminine softness in [this] public service uniform.” Oh, really ? Her pose makes me wonder exactly what public service she is performing! For official Red Cross service uniforms, click here. 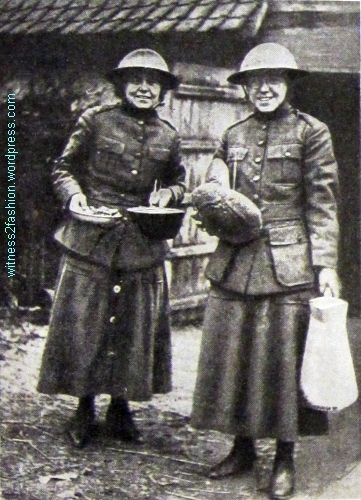 “Indoors or out, one could find many reasons why and times when just such a quaint smock and short skirt as [these] could be worn.” I don’t know what the editors of Ladies’ Home Journal were thinking, but the Red Cross did not allow women younger than 23 to serve coffee and doughnuts to the troops. They had their reasons. Although artistic, this leg-baring outfit might be subject to misinterpretation. 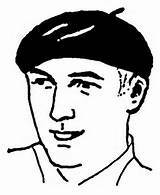 Many people are aware that, during World War II, such products as silk, leather, rubber, and nylon were needed for the war effort. 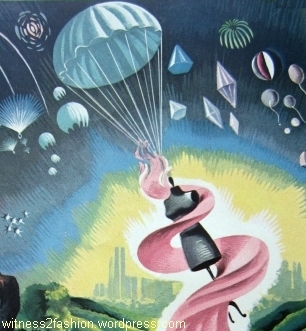 In the 1940s, the silk was needed for parachutes. 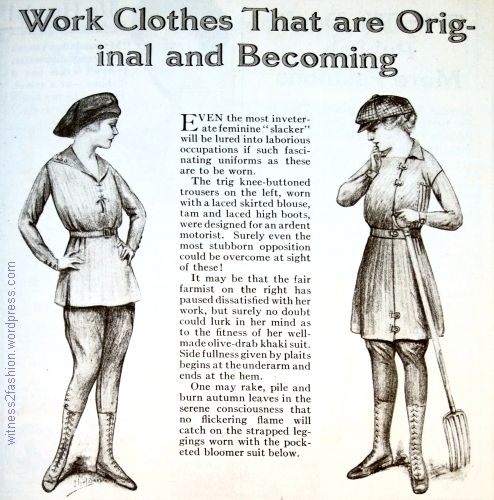 World War I apparently caused different shortages – of linen and wool. 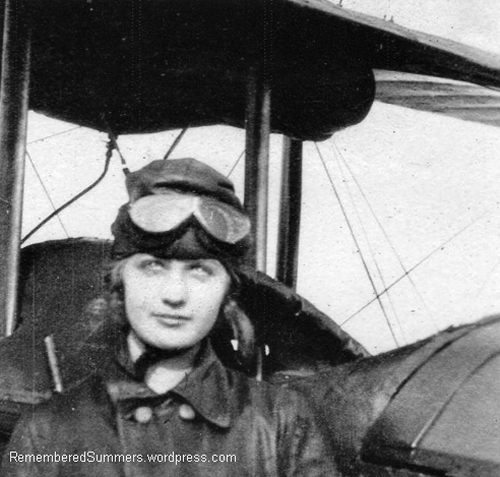 Vast numbers of silk parachutes were not yet needed; war planes were still a new idea. 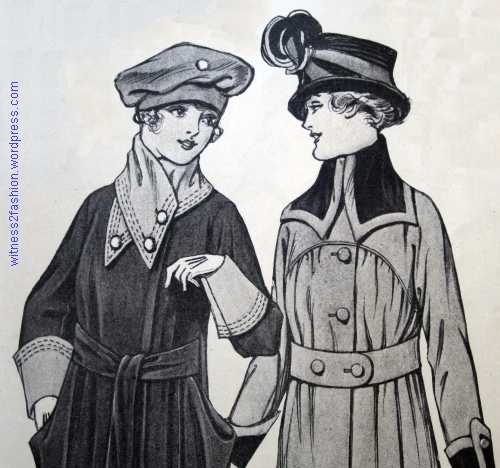 During the First World War, the wool was needed for uniforms, and the linen was needed for airplanes. 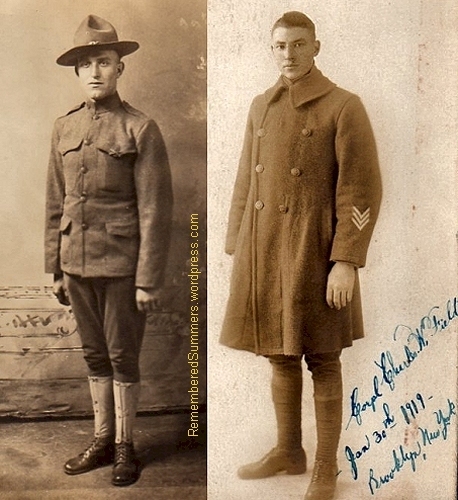 Two American Soldiers, World War I. Wool was needed for millions of uniforms. 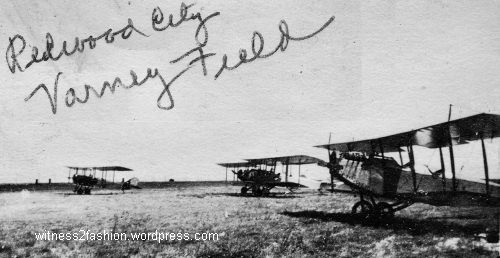 An editorial article, “The Green Peace of Summer,” which appeared in Delineator magazine in July of 1918, contrasted the way the war was experienced in the United States with its much greater impact in Europe. 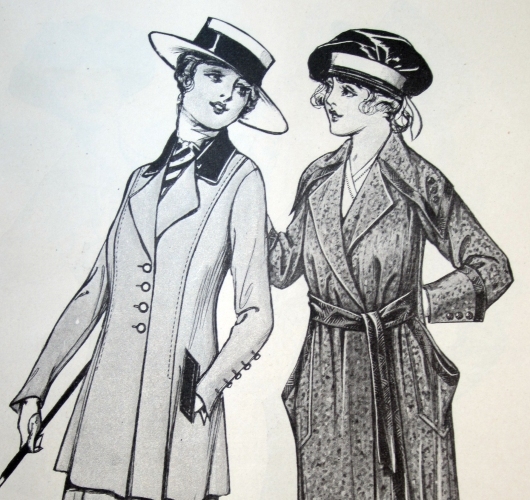 It also refers to the substitution of silk dresses for wool and linen, which may explain why silk dresses for daytime were so popular in the late teens and early twenties. 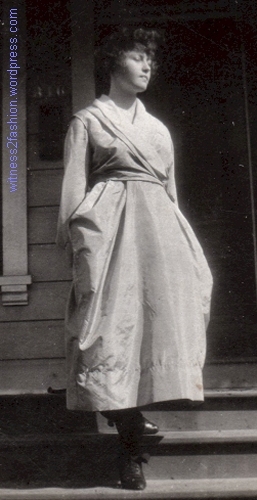 M. La Rue in a beaded satin day dress, circa 1921. “To-day [July, 1918] the green peace of our summer… fills us with… amazement, viewing it, as we all must do, against the somber background of the war. Over there gardens and fields and meadows are torn and gutted by giant shells…. Our world still goes about its business little changed outwardly for all the tragedy of the battle-fields abroad. “There are many reasons why the war has not made as great and immediate a change in our lives as it has done abroad. 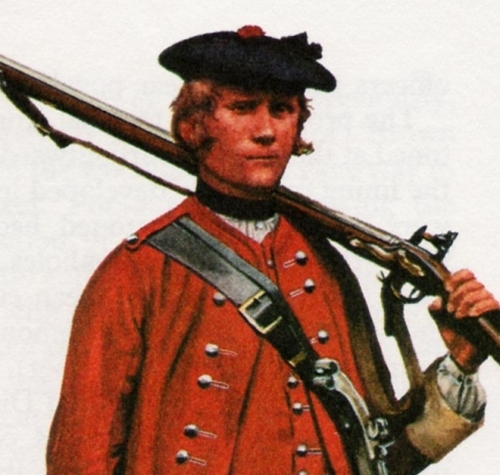 So many of our men are left, so many even of draft age have been excused because of dependents and because of war industries, that no revolution of work and life has taken place here comparable to what has happened in England and France. 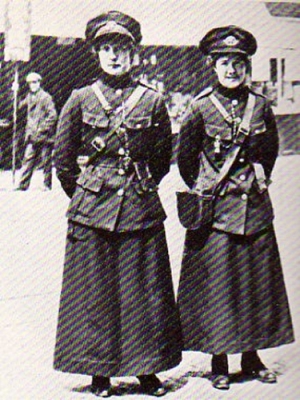 Of course, we have our women street-car conductors. In every country this has been the profession that women have turned to first. 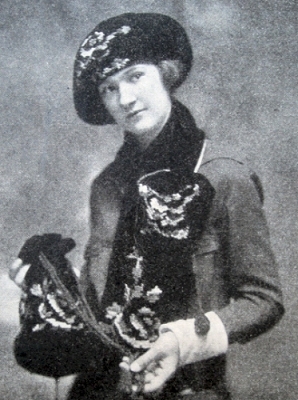 Young Woman at Flying School, about 1921. Used with permission of RememberedSummers. 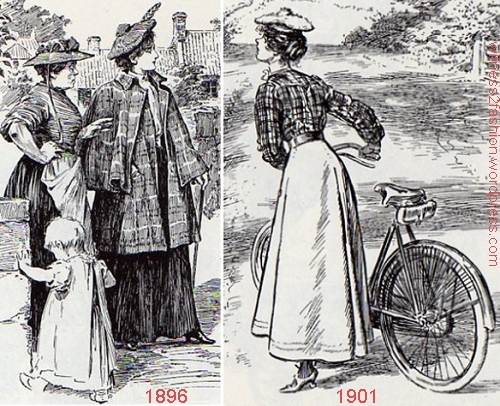 “But it is part of the spirit of the times that we see, not that we are deprived of linen, but that we have gained something gay and charming in the revival of gingham, that the difference in price between cotton and linen means many thrift stamps and comforts for the Red Cross. 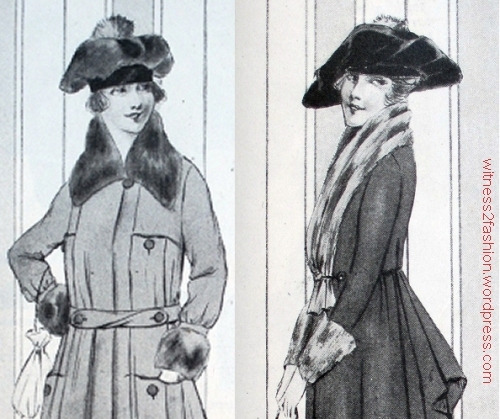 Silk Dresses from an Article About Remaking Clothes, Nov. 1918. 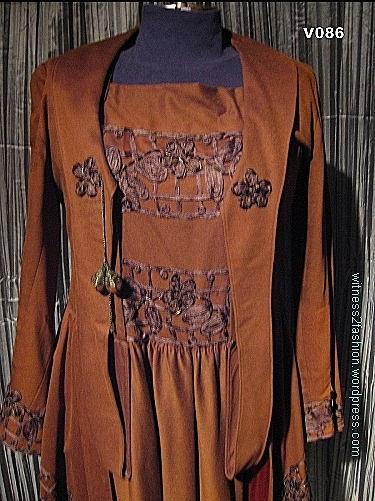 This beaded dress in cinnamon brown wool is hard to date precisely, because it shows signs of having been remodeled as well as shortened. 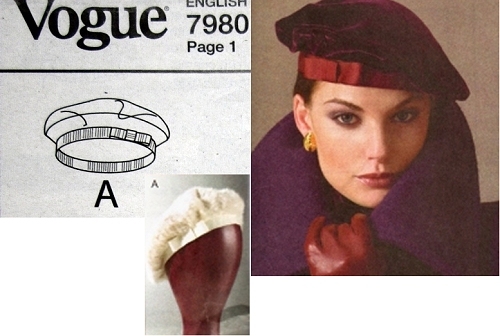 The hem was turned up several inches, which suggests that it was originally from the early 1910s. 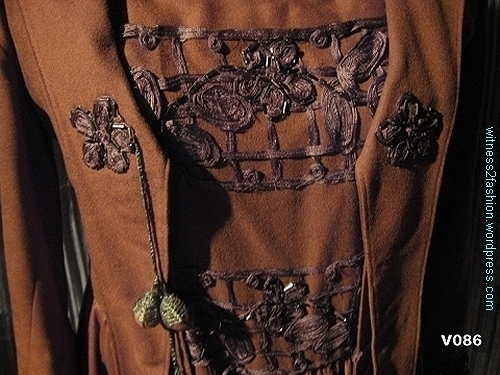 Front Detail. One tassel is missing. 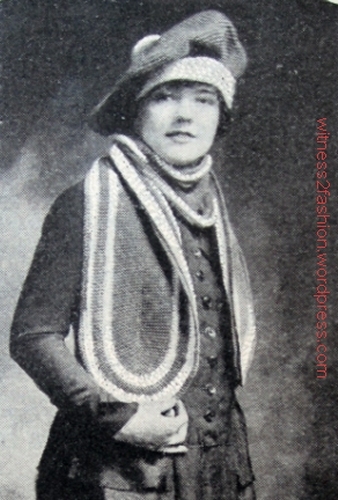 Note the way the extended lapels are looped under, and the odd, wrinkled strip that fills in the top of the neckline. Of course, this mannequin does not have a period bustline to fill it out. Some of the fabric (perhaps formerly a belt?) 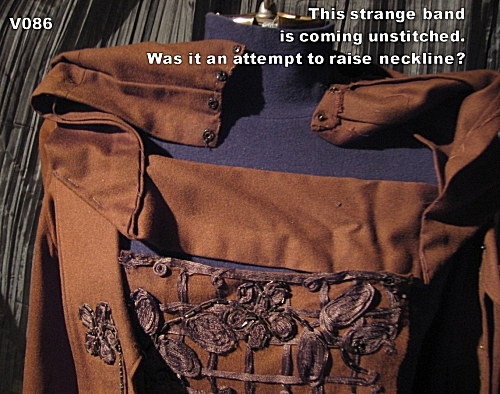 was used — rather crudely — to fill in the neckline, but it was hand-stitched in place with rotting thread and had to be removed. 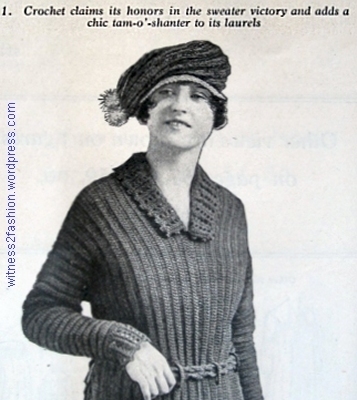 A bulky piece of wool, folded to fit in the neckline, and closed with snaps, was hand-stitched to the top of the neckline. Here it is partly removed. 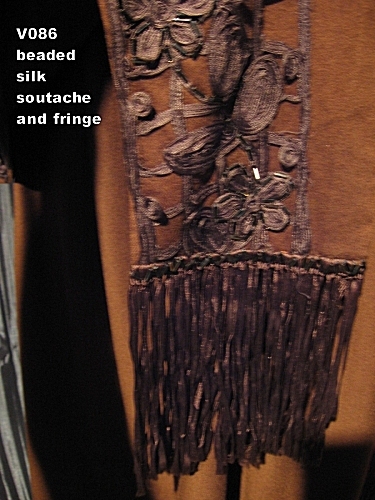 Fringe at the bottom of the long panel which ends the peplum. See side view.